We recognise that charities are run by people with energy and commitment who have strong views about their charity's future; this can sometimes lead to healthy disagreement and discussion within the charity. Unfortunately, there are other forms of disagreement that can lead to disputes. This guidance is concerned with disagreements that have escalated into a dispute. A dispute is a serious disagreement within a charity which, left unresolved, can lead to a breakdown in the effective governance and day to day management of a charity. Disputes occur most often in membership charities, usually over election of trustees or the balance of power and influence between groups, but they can also arise within a trustee body and between trustees of different charities. Where a dispute exists we expect trustees to seek solutions to the issues. This is most likely to mean engagement in some form of dispute resolution or mediation of the situation by an independent third party in order to provide an objective view of the issues and proposals to resolve the dispute. In most cases we will not engage with the charity or those involved without evidence that attempts have been made to seek a proper resolution. Even where we do engage our involvement will usually be restricted to ensuring that there are properly appointed trustees or providing authority for trustee elections to take place , but we will not intervene in the disputed issues outside of our remit. We cannot substitute our judgement for that of properly appointed trustees and our role as charity regulator is not one where we decide on personal, social or cultural issues that arise between individuals or groups. Our regulatory focus is on whether the trustees of the charity are acting within their powers and complying with their legal duties. The Risk Framework is our starting point when assessing any case in which we are asked to intervene, it allows us to identify issues that may be of regulatory concern which should be pursued by Investigations and Enforcement as an Inquiry case or contains regulatory concerns to be taken forwards by Operations. It will also highlight where there are concerns beyond those of an inquiry or regulatory case which nevertheless require intervention by us. It is the responsibility of the trustees of a charity to seek resolution to issues where a dispute arises. In membership charities it is the members that usually have the power to call the charity's trustees to account for their actions. The Commission's role is not to be a referee between parties for the issues in dispute. The starting point for our involvement in dispute cases is set out in the Risk Framework which confirms that it is not usually our policy to become involved unless the trustees and those involved in the dispute have sought help to resolve the issues. Our focus in any dispute case is on the proper administration of a charity by its trustees. In some cases we may be required to make orders appointing trustees or provide authorisation to put procedures in place to call trustee elections. We will do this usually where legal permissions do not exist for the trustees to act. We may disengage from action where it is disrupted by continual dispute or lack of cooperation because it is not a proportionate or effective use of our limited resources - the result could be that the charity ceases to operate, winds up or splits. We recognise that refusal by us to engage in a dispute or to disengage where there is non-cooperation may pose a risk to a charity's assets. Ultimately, any loss of charitable resource will be the responsibility of the trustees and those engaged in any dispute. This guidance is about disputes within charities and our approach in getting the trustees to resolve them. It distinguishes between a dispute which should be resolved by trustees and disputes where there is a need for us to intervene from a regulatory perspective or in order to provide legal permissions or appoint trustees. Our policy about handling dispute cases can be seen in chart format at section C1 and the legal basis of our policy is explained more fully at section E1. F1 What is a dispute? F2 What is the Commission's policy about disputes? F3 Must we always be involved where there is a dispute? F4 What advice do we give to trustees and others involved in disputes? F5 What can we do to ensure a charity has trustees? Dispute cases are difficult and can arise from a variety of complex circumstances with those involved holding strong convictions and points of view. When we are presented with a mixture of issues it can be hard to tell which ones are for us (and in what capacity) and which are properly for the trustees. Our general approach, as confirmed by our Risk Framework, is that we will not usually intervene in disputes unless we have very good reason to do so. The underlying factors are to ensure that there are trustees to take proper responsibility for the issues that rightfully belong to the charity and we recognise where we need to intervene. We need to recognise that there will be times when we will not engage and other times when we will withdraw from engagement with the charity because there is no legal reason for our involvement or those in dispute are failing to cooperate with us. This is not a 'failure' on our part but a reasonable response to the circumstances based on our Risk Framework. Dispute cases come to our attention usually via First Contact where we need to decide what action is needed as a result of the correspondence received or approach made to us. We need to make sure we make relevant and necessary interventions at the appropriate time. In many cases the issues in dispute are the responsibility of the trustees to resolve and where there is no reason for us to be involved we will advise the trustee to seek mediation or some form of dispute resolution. The Commission's Risk Framework is clear on this point (see Risk Framework) and this will apply even where one party is refusing to engage in such a process. This may seem harsh but in cases where we have no legal or regulatory role we cannot take responsibility for resolving the dispute. See the chart at section C1 that provides an overview of how potential dispute cases are considered and the table below, which sets out how they are considered on a divisional basis. Consider the information contained in that initial approach in terms of whether mediation or other dispute resolution methods have been employed and also whether the categories below have any bearing on what we have been told. No initial action for Operations. No initial action for I & E.
Highlight issues in line with Risk Framework that indicate regulatory matters that require our involvement. Seek further evidence if needed or pass to pre investigations assessment or Operations where sufficient evidence available for next steps on regulatory issues. Regulatory cases that do not meet the criteria for s.46 Inquiry but contain serious issues as identified by the Risk Framework are dealt with in Operations. Case is driven by regulatory issues not the dispute. Regulatory cases being pursued in Operations may need to make trustee appointments as part of a case dealing with regulatory issues. S.46 Inquiry cases for the most serious regulatory issues as identified by the Risk Framework. Case is driven by regulatory issues not by the dispute. Does the initial information provide firm evidence that trustees are not properly appointed (not merely speculation or accusation)? Our approach is that we presume trustees are properly appointed unless there is evidence to the contrary and that trustees can use the governing document or the Charities Act to appoint trustees and make any necessary administrative changes affecting their appointment. Where the evidence provided indicates that we need to act to appoint trustees, give permissions for elections or make governing document changes, pass to Operations for action. Operations case to make trustee appointments, facilitate elections to make trustee appointments, or make governing document changes which effect trustee appointments where cooperation exists for purposes of trustee appointment or governing document change. We deem cooperation to exist where the disputing parties have either worked together themselves or with mediators (see B2.4) and are coming to the Commission with a solution for us to authorise rather than with a problem for us to deal with. We will not engage with the dispute issues. This is not a regulatory case and we may withdraw from involvement if non cooperation interferes with trustee appointment or election or other processes. I&E involvement in trustee appointment issues would be only where it forms part of an s46 inquiry case. As a regulatory case we may need to enforce action by using our powers - see OG117 How the Commission Deals with Investigations Work. Does initial information indicate that there is a dispute about issues in which the Commission has no jurisdiction or reason to use our powers? Confirm that the issues are ones in which we would not intervene and that those involved should seek mediation. Suggest another regulator if appropriate. No action for I & E.
See the table at B2.3 which considers casework issues in line with these principles. Whilst there is no set time for dealing with a dispute case we will not get involved in drawn-out issues that extend cases unnecessarily where our input adds no real value to the final outcome. are there issues in dispute that would meet the criteria for an inquiry or regulatory case, irrespective of whether there is a dispute within the charity? If yes, such matters should be taken forward in line with the Risk Framework by Investigations and Enforcement or Operations. The drivers for the case are the regulatory issues and not the fact there is a dispute. In cases where there is a dispute there may be other issues where we need to be involved but only where we see a clear requirement for that involvement (on the basis of evidence) and those involved in the dispute are willing to cooperate with our action. Non cooperation between parties or with us may lead to our disengagement from process. Unless we have evidence to the contrary we presume that trustees for the charity are properly appointed and our expectation is for those trustee to take responsibility for the issues in dispute and to seek mediation or some form of dispute resolution. There may be many other issues that are likely to be the focus for disputes in charities but which do not fall for us to exercise our legal powers or require our involvement. Issues that arise in disputes and in which we will not intervene usually centre around decisions validly taken by the trustees in the administration of the charity which do not find favour with all members or all trustees. As such they do not fall for action under our Risk Framework and our involvement is not appropriate. Disputes may also arise where there are conflicting views of who the trustees are. This does not demand our automatic involvement. Those involved should look at the governing document provisions and trace back the process for making trustee appointments, taking their own legal advice as appropriate. They should also seek to regularise the position by mediation and use of the governing document processes for calling elections or making new appointments. In the context of disputes our view of what amounts to clear evidence will usually be documentation that gives a clear and objective view of the situation. This might include copies of authorised minutes of AGMs showing election of trustees, exchanges of correspondence between the charity and other parties on the question of trusteeship or other matters, confirmation of dates on which AGMs were held. We will not act on the basis of unsubstantiated accusation, claim or counter claim that something has or has not occurred. Why do we need to be involved? What do we want to achieve What will our exit point be? Trustees appointed in line with the governing document or trust law make unpopular decisions on charity issues that are within the range of decisions that a reasonable trustee body could reach. eg: The trustees have agreed to spend a large amount of the charity's money on a project which furthers its objects. Professional advice has been taken about the proposal and the charity's ability to deliver what is required. Not everyone agrees with the project. We do not need to be involved as decisions are taken by the trustees in line with their trustee duties and responsibilities and are not the subject of regulatory concern. Trustee responsibility for the issues in dispute. Confirmation by First Contact that we will not intervene and that it is for the trustees to resolve. eg: Claims that trustees are in place or have been removed because of vote and membership rigging allegations. We do not need to be involved. It is for those disputing the trusteeship to approach those they believe are not properly appointed. They should seek resolution by mediation and use of the governing document provisions to make further trustee appointments as necessary. Our involvement would be limited to making trustee appointments only where we receive clear evidence that the trustee appointments are invalid and it can be shown the governing document or Trustee Act 1925 provisions cannot be used to remedy the situation. It is unlikely that we would be able to prove or disprove allegations of vote or membership rigging where this is called into question. Neither could we support allegations of unfair removal where the removal process has been followed. For the disputing parties to seek their own resolution. Confirmation by First Contact that we will not intervene and that those involved should seek mediation, with any invalid trustee appointments being regularised using the governing document or other legal provisions. eg: Individuals acting as trustees where there has been no proper appointment process. Generally the charity runs well but this situation has been highlighted because of a dispute about other issues. Those acting as trustees are required to take action to make arrangements for proper processes to take place for trustee appointments. We expect them to engage with other parties, through mediation if necessary. Our engagement will be required where those involved are unable to act in a legal sense to regularise the trusteeship of the charity but we will not engage unless the disputing parties are in agreement for appointments to take place. If the dispute continues despite our involvement we may withdraw from the process. A point to remember is that unpopular decisions are not necessarily wrong decisions and those making them may still be the right people to run the charity. For those acting trustees to take responsibility for election of trustees in line with the governing document. Where this cannot be achieved legally we will make appointments by Order; or make an Order for someone to call an AGM so appointments can be made. We will only engage for as long as all parties cooperate with this process. Confirmation by First Contact that the issues should be resolved by mediation and those involved should come to us with proposals for regularising the trusteeship of the charity if they cannot do it themselves. eg: Allegations that those running the charity are making changes to the appointment provisions in a governing document to keep themselves in power (eg change from annual to 7 year appointments). Initially we may think that these issues would be for the trustees to resolve. However, we need to be certain that such proposals are not a way for the trustees to limit their accountability to the charity members and that what is proposed is in the charity's best interests. Engagement at an early stage to question the reason for this action would help us confirm or dispel whether regulatory or inquiry issues should be taken forward in line with the Risk Framework. is within a range of decisions that a reasonable body of trustees could have made. First Contact recognise a potential regulatory interest in line with the Risk Framework in order to ask the reason for the proposed change and confirm that action is being taken in line with governing document procedures. If it is found to be a reasonable proposal we will withdraw even though the issue may be contentious. It is for the trustees to manage the process in line with the governing document. If we have concerns under the Risk Framework the case should be escalated to Operations or Investigations & Enforcement to consider the issues and what should be done to remedy the situation. The case will then be driven by the regulatory issues and not the dispute. eg: Allegations that the trustees are refusing to hold an AGM or adhere to proper processes for appointing trustees. AGMs provide the democratic process by which members may call into question actions taken by trustees and are the vehicle by which new trustees are appointed. Prevention of, or refusal to hold, an AGM is a denial of rights of the charity's membership as set out in the governing document. Potentially this could be a serious issue and if we have clear evidence that an AGM has not been called without good reason we may need to take regulatory action. It is possible that reasons beyond the control of the trustees have created the situation (eg the foot and mouth epidemic which caused many meetings to be cancelled or delayed across the country for some months). To confirm whether or not regulatory issues need further consideration. First Contact recognise a potential regulatory interest in line with the Risk Framework for which an explanation is required. If the action is reasonable in the circumstances and action is being taken to remedy the situation we will not engage further but remind the trustees of their responsibilities. If there is no reasonable explanation and/or no action being taken to remedy the situation then the case should be escalated to Operations or Investigations & Enforcement to consider the issues and what should be done. The case will then be driven by the regulatory issues and not the dispute. The Charity Commission's role is that of regulator for charities; in doing this we register charities, provide information, give legal permissions and use our regulatory powers in cases of misconduct or mismanagement and to protect charity property or secure its proper application. It is not our role to mediate in disputes. The issues in dispute belong to those involved and are for them to resolve. Past experience of trying to impose solutions has not always been successful with the same issues re-emerging on a regular basis. Where a dispute exists we expect charities to engage in some form of dispute resolution process seeking specialist help as appropriate, such as mediation. It is important for those involved to recognise what is happening and take responsibility for resolving the issues, irrespective of differing points of view. Mediation and other dispute resolution services can be found usually in a charity's area of operation or nationally - see below. Some service providers will require payment; others offer their services for free. It is usual for payment of such services to be a proper call on charity funds provided that the decision to pay for mediation services is made in good faith and in the best interests of the charity and is reasonable within the range of decisions made by trustees. Where the parties involved refuse to seek any serious form of resolution we may refuse to be involved irrespective of what this might mean for the charity - see section B2.1 above. Civil Mediation Providers - The Ministry of Justice website - www.civilmediation.justice.gov.uk – provides a list of civil mediation providers working in the UK. All the mediation providers listed are accreditied by the Civil Mediation Council and employ local, professional and experienced mediators. This service provides members of the public and businesses with a simple low cost method of resolving a wide range of civil disputes out of court. Lawworks - http://www.lawworks.org.uk/ - this charity provides free legal advice, including mediation, to charities and community groups. Umbrella bodies - where an umbrella body covers a particular charity type we should suggest charities seek their help. Advisory, Conciliation and Arbitration Service (Acas) - www.acas.org.uk - where disputes are about employment issues. This list is not exhaustive and we are working to build partnership agreements with a number of organisations who can advise and give specialist help to charities. This information will be available through our website in due course. In line with their responsibilities trustees may also seek independent advice on legal issues related to governance of the charity. Based on the principles for involvement in dispute cases set out in section B2.2 and B2.3 above we may decide that our involvement is appropriate. We should be clear from the outset that our role is that of providing relevant permissions where needed and directing those involved to relevant advice and not that of adjudicating on issues in dispute as, in many cases, only the court may do this. The message to the trustees or anyone else involved in the dispute is that they are responsible for resolving the issues. It is not our role to attend such meetings. Permissions in the form of trustee appointments or authorisation for someone to call an AGM will be given where the parties involved engage with the process. Our policy developed inline with our Risk Framework is that where there are those that continually frustrate the process we will disengage, even if this means that the charity ceases to operate. Our involvement would continue only in exceptional circumstances where it is proportionate to the risks involved. Before we become involved in making trustee appointments or authorising individuals to call an AGM to appoint trustees we need to take a view on whether validly appointed trustees are already in place. If they are then we will not usually become involved in making appointments. Articles of Association for charitable companies and constitutions for charitable unincorporated associations will normally have trustee appointment provisions including processes for calling meetings for this purpose. Trust deeds sometimes allow for succession of trustees, where they do not the trustees are normally appointed in line with the Trustee Act 1925 - see OG510 section E2 Legal powers for making trustee appointments. Many dispute cases concern conflicting opinions on whether trustees have been properly appointed (particularly where they take a different view point to those who are making a complaint). It is important, therefore, to identify the appointment provisions in the governing document and consider what evidence we have to show how the acting trustees were appointed and if the rules were adhered to (eg minutes of past AGMs). Wording of governing document provisions can also be important - words like "shall" and "must" will indicate that particular action must be taken rather than allowing discretion to be exercised. Breaching a procedural rule does not always mean that the election was invalid; it will depend on the importance of the rule and the magnitude of the breach. [the governing document will often have provisions that explicitly say technical defects don't make a meeting invalid. ]The trustees should seek their own legal advice on this matter. Also, we would consider what evidence is available in terms of meeting minutes or deeds of appointment that would give an indication of whether proper procedures have been adhered to. We have a number of powers that can be used where we have taken a view that the charity has no (or insufficient) validly appointed trustees and we need to be involved to make trustee appointments or to facilitate an AGM so that trustees can be appointed. There will be limitations and advantages to using some of these powers which, in themselves, will form part of our decision making process. An example might be the need to obtain CRB checks (in itself a lengthy process) which can create instability in the charity until the individuals have been checked. Usually we have no discretion about making these checks so the timing issue is something we need to take account of when we considering case strategy. The Charities Act give us options about the way we use the different powers available to us - the powers quoted are Charities Act powers unless stated otherwise. We may use section 337(1) & (2) in conjunction with section 80(2) Order to add supplementary provisions, for example, to state that the appointments are for a limited period only and the trustees known as "interim trustees". It is important to be clear about the purpose of the section 80(2) Order (ie that of appointing trustees) before deciding on what may be supplemental to the Order. The use of section 80(2) can be a lengthy process because we are required to perform reasonable checks on the suitability of the potential trustees (including CRB checks where required) and in some cases publicising the draft Order. However, it remains a useful option if newly appointed trustees can simply follow the governing document to hold elections to appoint further trustees. This power is permissive rather than directive, which means that it gives authority to those mentioned in the Order to carry out a certain action but they are able to choose whether the action should be taken. We cannot impose the duty or obligation for action to be taken. We will not use this power where there are valid trustees or others in place that have authority to carry out what is required. Usually, we would use this power where there are no validly appointed trustees but there those willing to carry out the duties to ensure new trustees are appointed. The Order will provide them with the proper authority to do this. whether or not the trustees would normally be able to take that action under their own authority. those people who have 'a role' within the charity to carry out certain functions which they would otherwise not be authorised to do, for instance, authorise a holding trustee to call and hold an AGM to elect charity trustees (where none exist). This list is not exclusive but we need to remember that we can only use this power to authorise someone with an official role in the charity to take action in its administration. An Order under section 105 can include duties and directions that must be complied with if the powers it gives are exercised but it cannot require that the power is exercised or impose duties or directions that do not relate to those powers. An example here would be where we authorise persons to hold an election and then specify how that election must be carried out. If the election is held but not in line with what was stipulated it means the Order has not been carried out properly and the actions could be void. An Order under section 105 does not need to be published. However, we do have power to publish under section 337(3) - see OG501. a governing document may state "the AGM to be held in the month of April every year" - this should not be interpreted as an express prohibition on holding the AGM in any other month. Alternatively, if the governing document stated that "the AGM must be held in April and no other month" then we interpret this as an express prohibition on holding an AGM in a month other than April. If we decline to make an Order under section 105, when asked to do so, that decision is reviewable by the Charity Tribunal. As part of good practice in decision making we need to be clear of our reasons for making or refusing to make an Order and also make sure our reasons are properly recorded. A decision to make a section 105 Order is not reviewable by the Charity Tribunal but could be subject to judicial review. Again, our reasons for using this powers should be properly recorded. This power places responsibility for action on those involved and prompts action more quickly as section 105 Orders are not usually published, whereas section 80(2) trustee appointment Orders made by us are likely to be published, adding delay. Also, where needed, we would be required to carry out CRB checks before appointment when appointing under section 80(2). In some communities and charities trusteeship carries significant status. Allowing the appointment to be made by the community rather than by us can provide a sense of ownership from the community or membership and empowerment for those appointed, knowing that they have the respect of their community who placed them in that position. Section 105 on its own cannot be used to appoint trustees and therefore used alone may mean that the charity could be without validly appointed trustees for longer than is desirable in some circumstances. In other circumstances trustees may be appointed more quickly by using section 105 to facilitate an AGM to get trustees appointed. This will be a call on our judgement of the circumstances. Using section 105 on its own will depend on the wording of the charity's governing document and the precise events that have led to the Commission's intervention. For example, if the governing document provides for elections to be conducted by an election board or commission, rather than the trustees, then we can use the section 105 powers to authorise named individuals to form an election board and hold an election. This would be in contrast to the need for section 105 to be used in conjunction with or supplemented by other powers - see option 3. Section 337(1) & (2) could make incidental provisions as needed, for instance, to set out the purpose of the appointments. Section 105 could give authority for the interim trustees to hold an election in accordance with rules set out in the governing document. This power may be needed to ensure that the interim trustees can act, for example, there may not be enough of them to satisfy the quorum provisions of the governing document so they need our authority to act. Another use of section 105 could be to extend the period for holding the AGM alongside other provisions. Using these powers together will depend on the circumstances of the case and the powers in the governing document. it can be used to alter trusts and purposes and consequently is a useful and wide power. in these circumstances we cannot use the power to change the purposes of a charity unless it has been established for at least 40 years. Section 69 gives us power, by Order, to make a Scheme for the administration of a charity. The power to make such a Scheme can be appealed at the Charity Tribunal. The appeal can be brought by any charity trustee, the charity itself (if a body corporate) or any other person affected by the Order. We would use section 80(2) following an election organised by the charity in line with the governing document to ratify the result of that election. We would need to be satisfied of the proper conduct of the election and that by making the Order it would settle, for all concerned, who is responsible for the administration of the charity. It has the advantage of minimising the Commission's involvement at that time and in the future. It is likely that we will use this option only where there is clear cooperation between the parties in the dispute and positions are not too polarised. It is unlikely to work where one party organises the election without involvement or cooperation from the other party as, in the past, this has led to the party not involved in the organisation alleging significant irregularities in the conduct of the election. 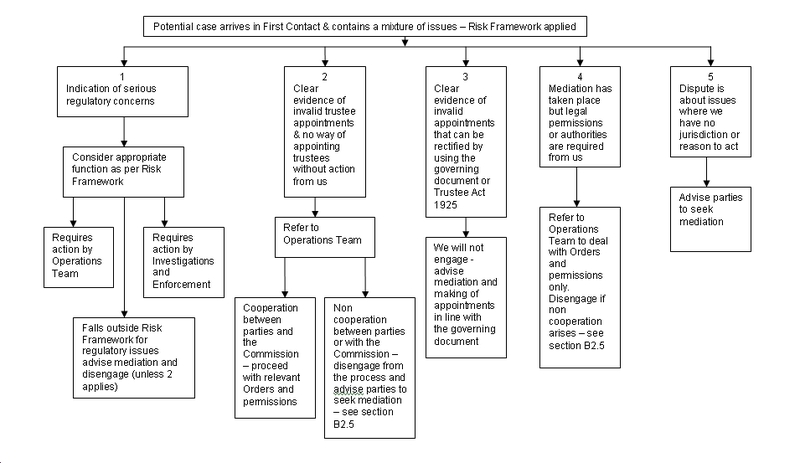 As set out in B2 above; disputes that involve regulatory issues as identified within the Risk Framework will be pursued not as disputes but as regulatory or inquiry cases. We will only open inquiries in the most serious cases. This is likely to be where the regulatory issue in itself is serious and in circumstances where there is evidence or serious suspicion of misconduct or mismanagement or the risk to charity or to public confidence in charity more generally is high. Simply by having a dispute in a charity does not mean that the conditions for opening an inquiry are satisfied. It will be the issues highlighted that drive the case and not that a dispute exists. The Commission's policy on the publication of draft Orders is set out in OG501 . Our approach in dispute cases is that, whilst there should be a presumption that draft orders should be published, we will consider each Order on a case by case basis. In some cases it may not be necessary to publish the draft Order and because we have discretion under the law and our policy we may decide to exercise that discretion. OG501 also highlights the need to consider the likely level of public interest when deciding on publication. Our experience in dispute cases shows that most interest comes from members of the charity itself rather than a wider level of public interest. We also see that the issues in dispute compete with our overarching concern that the charity should be brought under proper control by validly appointed trustees. A text version of this chart is reproduced below. Potential case arrives in First Contact and contains a mixture of issues - First Contact take a view of risk factors. There is clear evidence of invalid trustee appointments and those involved do not have legal authority to make appointments – go to number 8. Apply the Risk Framework to see if the case should be handled by Operations or Investigations and Enforcement. If we decide that the case falls outside of the Risk Framework check whether 3 applies. Refer to Operations make relevant Orders or give permissions, but, if we do not get cooperation from those involved we will disengage from the process and inform all parties - see section B2.5. Advise those involved to use legal provisions available to them and confirm that we will not make the appointments. Refer to the Operations team for action. Confirm that we have no reason to be involved in the dispute and that it is for the trustees to resolve the issues by mediation. The chart at section C1 gives a policy overview of our approach. The extent to which we will engage with charities where a dispute exists is underpinned by the Commission's Risk Framework. We expect trustees to seek some form of mediation or dispute resolution usually before we consider action. The Framework sets out the issues that we consider are most serious and with which we will take regulatory or inquiry action, irrespective of whether or not there is a dispute within the charity. where we are required to use our powers to make trustee appointments or facilitate an AGM (where appointments can take place) because the trustees or other people within the charity do not have the legal power to do this. The administration of the charity and the resolution of the dispute remains the the trustees' responsibility. If we do not receive cooperation from those involved when we need to make trustee appointments or make an Order to facilitate an AGM we may withdraw from the case. The law is clear on who is responsible for the administration of any charity and that is its trustees. Our policy is supported by section 20(2) of the Charities Act 2011 which prevents the Commission from directly involving itself in the administration of the charity or exercising functions corresponding to those of a charity trustee in relation to a charity. Likewise, under section 70(1) we are unable to determine title to charity property or determine any question as to the existence or extent of any trust. Therefore, where disputes involve property ownership issues we cannot intervene to prove ownership or get involved with issues such as doctrinal meaning. However, in inquiry or regulatory cases, it may be proportionate in line with the Risk Framework for us to use information gathering powers to seek evidence of facts that may resolve an issue - for instance, the file of a solicitor acting for the charity when a property was bought may show who gave instructions for purchase and where the funds came from. The table at section B2.3 provides how we apply this policy in a practical sense. Sections B2.5 and B2.6 set out how we use certain powers in a strategic way to appoint trustees and arrange for elections to be called. Section B2.4 considers mediation and from whom charities should seek help. that not all disputes contain regulatory issues that are for the Commission to engage with having considered the Risk Framework. We have power as a regulator under sections 46 and 76 to intervene where there is misconduct and/ or mismanagement in the administration of the charity or it is necessary or desirable to act to protect charity property or its beneficiaries and secure proper application of its property. Cases that fall short of inquiry action under section 46 may still be pursued as a regulatory case within Operations teams. The extent to which regulatory issues are pursued will be determined by the Commission's Risk Framework, which provides a proportionate approach based on the seriousness of issues arising. In Muman v Nagasena  4 All ER 178 Lord Justice Mummery stayed the proceedings because he identified that they were charity proceedings and the parties had not sought the required consent of the Commission. In the order directing that the proceedings be stayed he also directed that the stay should not be lifted until after the both parties had attempted to resolve the dispute by mediation. He commented that substantial sums of money had been spent on litigation without achieving any resolution, that the spending of money on this kind of litigation did not promote the purposes of the charity and no more money should be spent until the Commission had authorised the proceedings and all efforts had been made to secure a mediation of the dispute. Southampton City Council v Southampton Medina Mosque Trust Ltd  EWHC 2376 (Ch) was a dispute about which party was ultimately entitled to the ownership and powers of management of a Medina mosque in Southampton. At the beginning of his judgement Mr Justice Davis commented: “That a court, necessarily applying principles of English law, has to resolve disputes of the present kind that have arisen is most unfortunate. A case of this kind in truth cried out for some kind of mediated solution. But that has proved unattainable. Other cases in which judges have expressed their view that litigation between charities or between parties involved in one charity is a regrettable or deplorable thing include Scott v National Trust for Places of historic Interest or Natural Beauty  2 All ER 705 and British Diabetic Association v Diabetic Society  4 All ER 812. The courts have also been clear that they cannot rule on disputes that turn on questions of doctrine in religious charities. Relevant cases include Varsani v Jesani  Ch 219 and Shergill v Kaira  EWCA Civ 983. In Shergill v Kaira the court was asked to consider the validity of the appointment of the current trustees of the charity. Although this appeared to be a question of the proper interpretation of the constitution, the court considered that determining this question involved taking a view on whether or not the “Third Holy Saint” was a proper successor to the Second Holy Saint, and that this could not be determined simply by applying the provisions of the charity’s constitution. They considered that it would involve looking at the doctrine and practices of the relevant religious group, and that this was something that was beyond the scope of what the court could rule on. The court advised the parties to engage is some form of alternative resolution procedure rather than continuing with the litigation. In Varsani v Jesani the court was of the view they had no jurisdiction to rule on the religious differences between the parties. However, they were also of the view that this did not prevent them from exercising their jurisdiction to make a regulatory scheme to divide the property between the two factions in the dispute because the scheme could be made without having to resolve the religious differences between the parties. This is a remedy that the courts have been prepared to grant in other cases, particularly where there has been a schism in a religious charity. In White and Others v Williams and Others  EWHC 940 (Ch) title to three properties used by three church congregations (one established as a separate charity) was held by a charity on trust for the purposes of the particular congregations which met in them. Following a schism, communication between the charity and the congregations broke down. The charity had financial difficulties and the question arose whether the properties were available to that charity to sell to satisfy its debts and pursue its charitable purposes. The court decided that in the circumstances the court had jurisdiction to make or direct a cy pres scheme and directed that such a scheme should be made. Our approach to disputes is set out in a charity at section C1 and the legal basis is set out in section E1. Casework Guidance -section B sets out the way in which we apply the policy to different circumstances. No, we will not always be involved. The extent of our involvement will be appoint trustees and facilitate elections for trustee appointments to be made where those involved are not able to take action themselves. See policy overview. Trustees and others must seek mediation or other help to resolve issues. The Commission's role is not to arbitrate in disputes but we will highlight organisations that can - see section B2.4. Where existing trustees or others involved with the charity are unable to make trustee appointments we will use our powers for this purpose. We will also use our powers to authorise others to call an election to appoint trustees. See sections B2.5 and B2.6 on our strategic approach to using powers for trustee appointments. I note your concerns that a dispute has arisen at this charity. Seeking resolution of the dispute is a matter for the charity trustees. The Commission will become involved only where there are regulatory matters that it is proportionate for us to engage with as identified in our Risk Framework or where legal permissions are required because the trustees have no legal authority to act. It is appropriate that the trustees seek some form of mediation or dispute resolution and that all parties in this dispute should take steps to resolve the issues amicably in the best interests of the charity and its beneficiaries. We will not comment further on these issues. The responsibilities of charity trustees are outlined in our web guidance The Essential Trustee (CC3). The Charity Commission's Risk Framework can be viewed on our website. The Commission's action is dependent upon confirmation by all parties that they agree to our involvement in this way. This may be in the form of a mediation agreement or a letter signed by all parties. However, the Commission will only use its powers where cooperation continues to exist for this process and we expect all concerned to act in the best interests of the charity in resolving any issues in dispute.